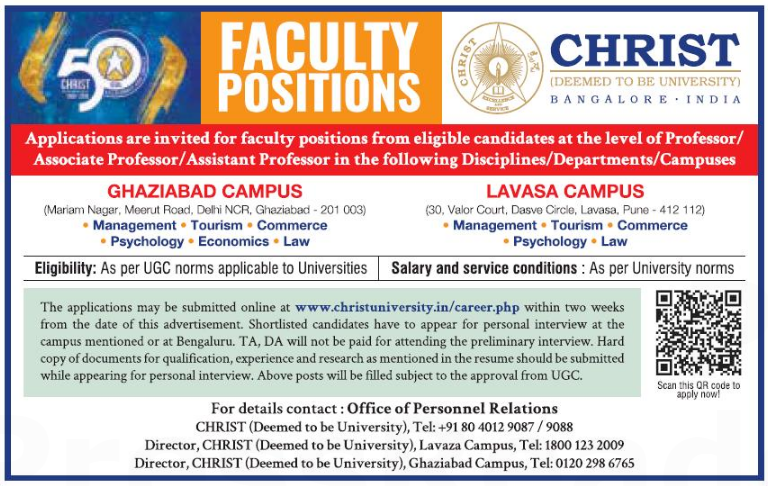 Christ Deemed to be University, Bangalore has advertised in THE HINDUSTAN TIMES newspaper for recruitment of Professor / Associate Professor / Assistant Professor jobs vacancies for its campuses located in Ghaziabad and Lavasa. Interested and eligible job aspirants are requested to apply within 14 days from 18th September 2018. Check out further more details below. About University: Christ University, formerly Christ College (Autonomous) affiliated to Bangalore University was established in July 1969. It became the most preferred educational institution in the city of Bangaloru within the first three decades. From 1990 onwards it has scaled greater heights. Due to the introduction of innovative and modern curricula, insistence on academic discipline, imparting of Holistic Education, a team of creative and dedicated staff, the institution has been continually rated amongst the top 10 educational institutions of the country. It has the rare distinction of being the first institution in Karnataka to be accredited by National Assessment and Accreditation Council (NAAC) UGC for quality education. How to Apply: Interested and eligible candidates are requested to apply ONLINE the web link provided below. Hard copy of documents of qualification, experience and research as mentioned in the resume should be submitted while appearing for personal interview.